Azad Watches Presents "Legends Of The Game" Limited Edition Timepieces: Featuring Juilus "Dr.J" Erving, Joseph "Rev.Run" Simmons & Alex Sensation. What would basketball be without the slam dunk? What would Hip-Hop be without those three friends from Hollis, Queens that became the games' first superstars? What would La Mega be without the sensation? Without knowing the history one can never understand the present. Azad Watches is proud to present "Legends Of The Game"TM. "Legends Of The Game"TM, Azad Watches' newest limited edition collection. Blending the precision, uniqueness, quality and exclusivity of Azad Watches with the legacy and impact of the most iconic and recognizable individuals in sports and entertainment. Honoring these "Legends Of The Game" is a task that Azad Watches Inc has taken on with a great deal of appreciation, detail and respect to the foundation that these "Legends Of The Game" have established for the rest of us to build on. 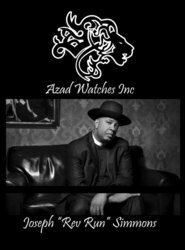 Azad Watches Inc announces its first "Legends Of The Game"TM, NBA hall of fame Juilus "Dr.J" Erving, rock'n'roll hall of fame Joseph "Rev.Run" Simmons and legendary mix master Alex Sensation. "Rev.Run" and "Alex Sensation" collections are slated to launch in Summer 2011; Dr.J collection Q1 2012. Each timepiece is customized and inspired by the achievements of each "Legend Of The Game". Azad Watches Inc felt it was time to remind those that were there and teach those who were not, the influence each "Legend Of The Game" has had on pop culture and society as a whole. Communicating that message through limited production and edition timepieces is homage that Azad Watches' creator Babak "Bobby" Ermankhah, a visionary who has built his success on creative offerings, is more than willing to pay. "Legends Of The Game"TM by Azad Watches.